Colac, a rural city on the Princes Highway, western Victoria, is 70 km south-west of Geelong. It adjoins the fresh water Lake Colac, one of several western Victorian lakes. Much of the landscape is volcanic in origin, with a mixture of fertile soils and stony rises. To the south of Colac there are the Otway ranges. In 1837 Hugh Murray and several other pastoralists took up occupation of the Colac district. The beginning of the Colac township came with the construction of the Crook and Plaid bush inn (1844) at the corner Queen and Murray streets. The township was surveyed later in 1844. Within four years there was also a general store, a police court, a Presbyterian chapel (1848), a post office and a school (1850). It is thought that the name 'Colac' was derived from an Aboriginal word meaning sand or fresh water, a reference to the lake. 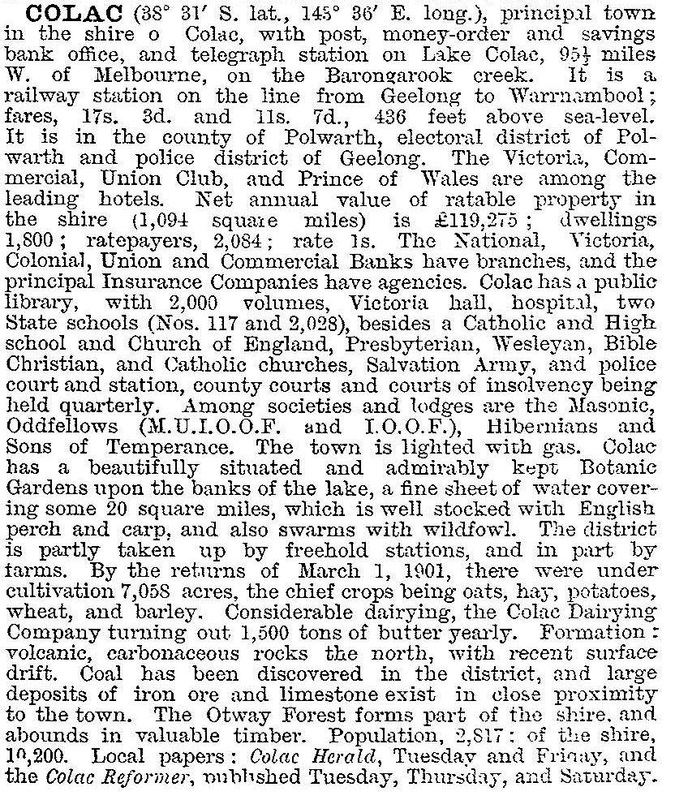 With a population of around 600 people during the 1850s, Colac was of sufficient size to attract a range of businesses and other institutions: two flour mills, Catholic and Methodist churches (1856 and 1857), a district road board and a pastoral and agricultural society (1859). In 1864 the Colac Shire was proclaimed. Until the 1880s Colac was a regional township surrounded mainly by large pastoral estates. Its growth was steady, if unspectacular, until then. There was a turf club (1862), a rowing club (1871), two newspapers (Observer 1866-74, and the Colac Herald 1869- ), some substantial church buildings which replaced the original structures and a botanic garden (1865) beside Lake Colac. The Memorial Square was reserved in 1873, and for many years served as a parking lot for horses and jinkers belonging to shoppers. Thomas Austin of Barwon Park, near Winchelsea, had released some wild rabbits for acclimatisation in 1857. They acclimatised spectacularly, and Colac's first factory, a rabbit cannery, functioned from 1871 to 1889. During the 1880s several pastoral estates were subdivided, and those around Alvie, Cororooke and Warrion, north-west of Lake Colac, contained particularly fertile land. They were converted to dairying, fodder cropping and vegetable growing, as well as general grazing. The extension of the railway from Geelong to Colac in 1877 provided improved transport for marketing, and lines were constructed north from Colac to Beeac (1889) and south to the Otway ranges (1902). Timber milling became a significant industry in Colac. Colac's growth continued, doubling between 1901 and the mid-1930s, and doubling again to 10,000 people by 1970. A waterworks trust established a reticulated supply in 1911, and reticulated electricity and a town sewerage scheme were established in 1928. The shire council established an abattoirs in 1924. A railway line to the Alvie dairying areas ran during 1923-54. Bulla/Regal Cream Products, Moonee Ponds, opened a factory in 1926, later moving to premises in Connor Street. Brick making and a flaxmill began in the 1930s, the latter ending soon after World War II. An agricultural high school was opened in 1911. During the postwar years some of Colac's notable buildings and amenities were demolished or substantially changed. Bilson's department store was acquired by the Foys-Cox Bros retail chain in 1952, ending as a Target store. The Victoria hall was closed in 1979, subsequently becoming a Fosseys variety store. The Peace memorial library building and the court house were demolished, and the branch railway lines from Colac were closed by 1962. On the other hand in 1960-62 Colac gained a technical school, Trinity college and Sacred Heart college. Colac is a regional centre, competing somewhat unequally with the larger Geelong, Ballarat and Warrnambool. Its industries are mainly agricultural and the processing or sale of products derived from agriculture, eg Regal Cream Products, timber processing, livestock sales. Other industries include sawmilling, joinery, local engineering and printing. (The Colac Dairying Company's Colac factory was closed in 1987 when taken over by Bonlac.) Tourism is stronger in the south, in the Otway ranges and along the Great Ocean Road. In 1995 Colac had five motels/hotels. Its retailing sector in 1986 had 145 shops, about one-seventh of Geelong's and about one-half of Warrnambool's. Turnovers were in about the same proportions. Colac has a racecourse and a golf course to the south, at Elliminyt, three reserves with ovals, a foreshore reserve and botanic gardens at Lake Colac, a showground and facilities for bowls, tennis and swimming. There are State and denominational primary and secondary schools, a hospital and the Colanda centre for disabled persons. Colac's commercial centre is Murray Street. Several of its historic structures have been altered or revamped, but the former National Bank, agricultural high school, former SEC office (1938) and the Austral hotel (1904) are easily identified. Almost unaltered are the Anglican and Presbyterian churches and the Masonic hall (1923) in Hesse Street, the Oddfellows hall (1891) in Gellibrand Street and the large convent (1889) in Fireman Street. On 23 September 1994, Colac city was united with Colac and Otway Shires and a small part of Heytesbury Shire to form Colac-Otway Shire. The shire offices are in Colac. The G21 Regional Growth Plan predicted Colac's population will grow to about 20,000 people by 2050. An experimental new industry, growing high end shitake mushrooms on fallen blue gum logs, began in 2014.